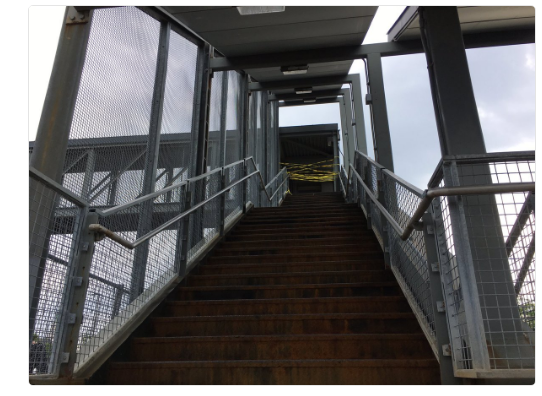 FRAMINGHAM – The rusted stairs at the Framingham commuter rail train station are now closed for repairs. The MetroWest Regional Transit Authority (MWRTA) was waiting on a permit from the Commonwealth of Massachusetts to complete the needed repairs. Riders of the commuter rail have been complaining about the condition of the stairs for months. The inbound side stairs were closed today, June 27, with caution tape. To access the outbound side, users are asked to use the elevator or walk to the lights at the intersection of Route 126 and 135. The project will take about 14 weeks, weather permitting, said MWRTA Director of Marketing /Communications & Intermodal Operations Sara White. The cost of the project is $375,000, which was funded by the MWRTA through a grant from the Commonwealth, said White. Riders of the commuter rail have pointed out that the elevator’s permit expires on June 30, 2017. “We were waiting for a new elevator certificate which we just received. The elevators will be updated with the new certificate today,” said White on June 29.